1. General articles on chaotic phenomena and related subjects. 2. 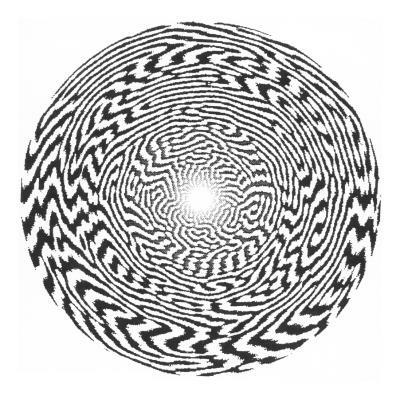 Numerical modelling of hallucinations, as self-organized patterns in the visual cortex due to long-range neural inhibition versus short-range activation (see figure below). 3. Simulation of coupled biological cycles using analog circuits. 4. 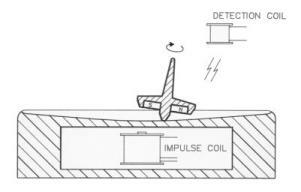 Analysis of an electrically driven, chaotic spinning top (see figure below; induction in the impulse coil drives the magnetic top). 5. Chaos induction by modulating with periodic parameter kicking. 6. Methods for analysis of images of periodic and turbulent waves. 7. Kinetics and thermodynamics of enzymes. 8. Simulations of three-dimensional structures in electron-hole-plasmas using partial differential equations. Comparison with evaluations of conductivity measurements. 10. Simulations of tectonic processes. 11. Generalization of the second law of thermodynamics to small systems and short times. Schmick, M. and M. Markus, "Fluctuation theorem for a deterministic one-particle system". Physical Review E 70, 065101 (2004). A. Greilich and M. Markus, "Correlation of entropy with optimal pinning density for the control of spatiotemporal chaos". Nonlinear Phenomena in Complex Systems 6, 541-546 (2003). In the web.